It's rare when a movie transcends pop culture's usual 15 minutes of fame and becomes a time-tested classic. It's rarer still when the movie is a low-budget, black and white independent feature produced so far off Hollywood's radar that it didn't receive national distribution. What this particular little movie had going for it was a fresh, talented director and the public's hitherto undiscovered phobia about and fascination with flesh eating zombies! 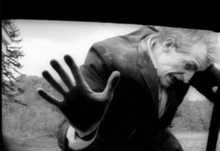 Filmed in 1967 by then fledgling director George A. Romero, Night of the Living Dead is a film that while raw in some of its production, was and is spot-on in evoking the most dreadful and deep-seeded of frights. It redefined a lackluster monster and gave rise to both a new genre in horror and a new image in the public consciousness. 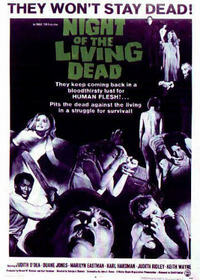 There's no denying it, Night of the Living Dead is THE archetypal zombie film. The story is simple; a group of strangers take refuge in an isolated Pennsylvania farmhouse from the re-animated dead, mindless and hungry for human flesh. Mmmmm, that's good eatin'! When Barbara (Judith O'Dea) and her brother Johnny (co-producer Russell Streiner) visit the countryside grave of their father, a wild-eyed, crazed man suddenly attacks them, leaving Johnny dead and Barabra fleeing. The nearby farmhouse draws not only Barbara but another seeking its seeming security, an African-American man named Ben (Duane Jones). Ben fights off a few "things" and tries to calm the bewildered Barabra. When a group of people who'd been hiding in the cellar come forth, instead of working together tempers flare and they struggle amongst themselves. The young couple Tommy and Judy (Keith Wayne and Romero's receptionist and later Russ Streiner's wife Judith Ridley) and older husband and wife, Harry and Helen Cooper (co-producers and later spouses, Karl Hardman and Marilyn Eastman) went into the basement with the Cooper's daughter Karen (Kyra Schon) for safety. Karen had been bitten by one of the "things" and was seriously ill. Their only hope is to get to the farm's gas pumps and fill Ben's truck with enough gas to make it to safety. The path to the pumps however is blocked by you guessed it, the ever-lovin' living-dead whose numbers only increase as the night wears on. Budgetary restraints and a lack of experience may have added some rough edges to Night, but they don't really diminish the film; they actually add to its surreal atmosphere. For instance, the camera work is stationary, never changing position. Each shot is from the same, locked vantage point. Most of the shots are very tightly framed and from low and skewed angles. Sometimes you can see the ceiling. Sometimes the camera is unsteady and shaky. It all helps create the claustrophobia and unsteadiness that's so integral to the film's power and message. The walls are closing in; the wall of zombies outside, and the wall of mistrust and fear inside. The other rough edge I'll mention, if you can even call it that, is the acting. It ranges from quite good to "I'm glad she didn't have more lines." Again, this only makes the proceedings of the film more odd and maybe a little more unsettling. If you can suspend your disbelief for the dead rising chances are some stilted acting won't bother you. He really is coming to get you, Barbara. George A. Romero's Night of the Living Dead (1968). When speaking of the film's cast, Duane Jones is often mentioned. His casting in 1967 as the lead was unusual, against type, and thought provoking. Judged solely on performance however, I most appreciate the depth of range displayed by Marilyn Eastman. Her performance conveys a depth of emotion and gives a real sense of truth to her character's plight. The horror that overwhelms her face in her final scene is one of the key moments and images that make this movie a standard. By adding a small sci-fi twist of insinuating the cause of the living dead could be radiation brought to Earth from a mission to outer space, George Romero elevated the zombie from black-magic slave to the horrible embodiment of science and society gone wrong. His voodoo-less image of the ceaselessly encroaching, mindlessly shuffling, people eaters who are "coming to get you" reflected many fears felt both yesterday and today. In the post-World War II era of the Cold War and global threat, movie monsters evolved from the thief in the night, picking off one victim at a time monsters of old like Dracula and Frankenstein to threats to the very existence of mankind itself. You can draw a direct line to the thematic implications of the zombies in Night from those of the pod-people in the 1956 sci-fi thriller Invasion of the Body Snatchers and then to the Borg of Star Trek. All three represent overwhelming forces that will stop at nothing until they infiltrate everything and everyone. Those they assimilate become emissaries who spread out and convert others who convert others still. They instill an even deeper seeded psychological fear than destruction of the human race; they take away not just your life, they take away who you are. What the most frightening thing about those monsters is, we are the zombies, the pod-people, and the borg. They are us, distilled into not so flattering reflections of who we are and what we do. Society devours itself, subjugates itself, and fears itself. To paraphrase the late comic-strip artist Walt Kelly, "We have seen the enemy, and he is us." Of course, the movie targets far more visceral fears too. So, if the social subtext of the zombies is interesting but not really scary on a gut level you say, remember, they are dead people who want to eat you. Dead-people-eating-you. If that's not enough to get the juices of primordial fear pumping through your veins, you stand to make a lot of money on either Fear Factor or the freak-show circuit. Unless you've been in a vacuum, you know George Romero has gone on to film the extremely popular sequels to Night and a great many more successful (and not so successful) films. Night and its sequels Dawn of the Dead, and Day of the Dead have been imitated by Lucio Fulci (Zombie) and Danny Boyle (28 Days Later), parlayed by Dan O'Bannon & co-writer of the original script John Russo (Return of the Living Dead), and inspiring to Simon Pegg and Edgar Wright (Shaun of the Dead), Michael Jackson – no jokes please, John Landis, and Rick Baker (Thriller) and millions and millions of others who see what George Romero has done and view him as an inspiration to do something of the same themselves. Night is not only a cult phenomena popular amongst the midnight movie crowd, oh no, it has some real credentials. It has been recognized by the American Film Institute and the U.S. National Film Registry. Unfortunately for its creator, a copyright loophole and an unintentionally omitted copyright notice on prints of the film have allowed it to become public domain, free for use and abuse of the public. While it is recognized as a praise-worth cinematic work and cultural phenomena, most all of the Night merchandise and copies of the film sold and broadcast earn nothing for Romero. A remake, released in 1990 and directed by longtime Romero cohort and master of splatter makeup Tom Savini, adds new twists to the old story and is quite an enjoyable adaptation. Romero penned the script, adding to that film's overall quality and continuity with the original, something the recent remake of it's sequel Dawn did not have. The fourth film in Romero's Dead series is currently in production. Titled Land of the Dead, it will surely continue the tradition of scaring, inspiring, and commenting on all of us. So there you have it, George Romero's Night of the Living Dead is a bona-fide classic, inspirational, thought provoking, and most importantly still very scary after all these years. Thanks for the nightmares George! Mm... Some of that blood was tasty Bosco chocolate syrup! The official 40th Anniversary Special Edition DVD released by Dimension features a quote from this very review on the back cover.